I am also very excited Re: this new artist. Yes yes, I want to see new sprites! SO glad this game is finally getting off the ground! As for new spells, I don't know. I certainly wasn't planning to put a whole bunch of new ones in because there are already plenty that haven't really had a chance to shine. On the other hand I wouldn't be surprised if a couple trickled in during development as we come up with puzzles. I'm thinking the middle one might be Minnie, I'm liking the new style especially the capes. This makes me oddly happy. The one in the middle is Minnie? Or is she some new character? I like them. I think this new artist will be fine for the game. Wait... so Damien's going to be in the sequel too? Well, that's something to look forward to... or be afraid of, either or, it's just as well. Wish I could be teased with MOAR characters though... like the Phifer twins, they were always fun... but I am nothing if not patient, so I'll wait for progress to be made before expecting more. 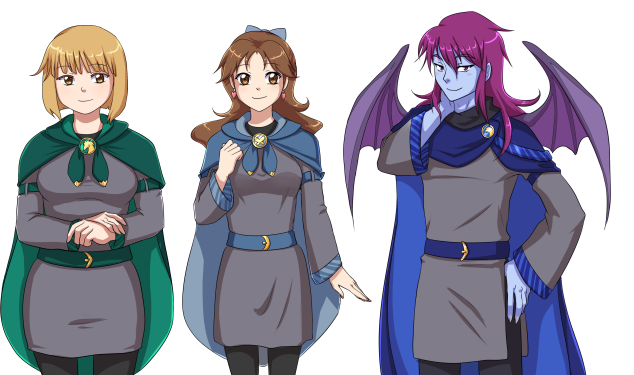 Ellen Middleton, Minnie Cochran (the student council president who also helped you with studying on Saturdays starting about midway through the year), and Damien Ramsey. Don't ask me how I remember everyone's last names. Last edited by Mystic Cake on Sun Apr 28, 2013 3:21 am, edited 1 time in total. Wolf Hall is concurrent with Horse Hall, or rather replaces it, I believe, unless some vague third roommate of Ellen and Virginia's is going to be alluded to in Wolf Hall. I think all the games are meant to happen in the same year. Anyway, the new art is cute, always happy to see some progress. As always, I tend to like what I liked at first, so I really prefer the Horse Hall uniforms, but that's probably just because I like to see boys wearing dresses. I do hope Ellen's hair gets a little more personality, though. I know she complains she's a "rock with hair" but I do love the messy fly-away style from Horse Hall. She doesn't have to have a bed head, just more life. But then, I'm a girl who draws hair as if it emotes by itself. Minnie is as cute as a button, though. I have a critical weakness for Mins.